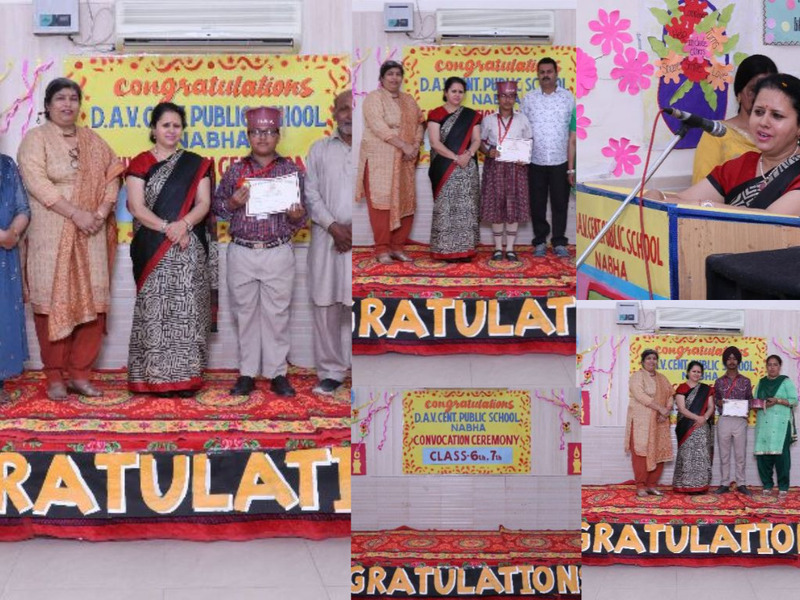 DAV Centenary Public School,Nabha celebrated convocation ceremony to applaud the enthusiastic learners of the classes 6th to 9th and +1(Arts,Commerce, Medical and Non medical) for their commendable performance in the session 2018-19 under the guidance of the honourable Principal Miss Meena Mehta on 28th March, 2019. The ceremony was attended by all the parents of the students from middle,secondary and senior secondary classes.The celebration commenced with the chanting of DAV gaan. The Principal welcomed all the parents.The premises of the school was fully decorated. The most important part of this auspicious day was the felicitation of young graduates wherein the delighted students dressed in Graduation robes and caps walked on the stage .The meritorious students were given gold, silver and bronze medals and photographs were clicked. The Principal declared the scholarship of Rs 5100 to the students of classes 6th to 11th who have scroed above 95% marks. The Principal addressed the gathering by highlighting the vision of the school and role of parents and teachers in the students’ learning process. She said that excellence in academics is the hallmark of a good institution. She further emphasized that a school can't progress without the cooperation and interaction of the parents. She congratulated and blessed all the students for their excellent performance in academics. She said that every student has a lot of potential and that potential can help accomplish wonders. She said that our vision is to make our school one of the best schools of the city by providing our students best academic facilities and turn out citizens who may become inspiring leaders with a humane touch.